Can't play the game, it runs so slow, that I could only pass the Dominos pizza cartel, it gave me a headache. Is it bad that I'm seriously considering seeking advice or possibly even work from y'all on a possible Unity project? Damn... That was way too fun. Hey, I'm having problems trying to run the game. do you know how to make the game run? I keep on trying to open the game with Internet Explorer and whenever I select "Open" it opens a small page that immediately closes. Can anyone help? When I plug in my PS4 controller, the camera just keeps spinning around Noid. I've also tried it with DS4Windows and it still happens. Any tips? I'm just curious, but has the dice not spawning during the final boss glitch not been fixed yet? I first downloaded the game when it came out, and this glitch caused me to stop playing for a couple weeks. I downloaded it again today and copied the save data file into the new version and the glitch is still occuring. Could you list what GPU and OS version your system has? Were you using a keyboard or a controller? I hope so too, it is such a fun game that could be even better with only length added to it. 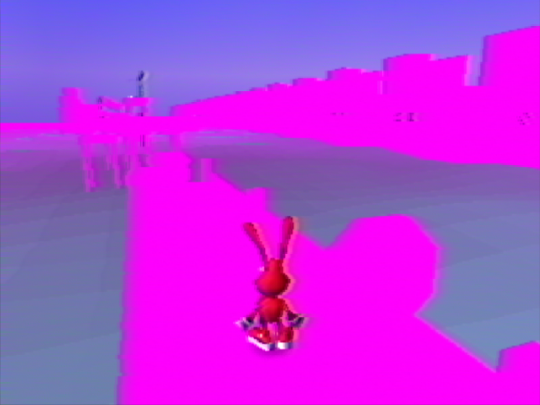 When I get in the game the camera keeps revolving around Noid and I can't stop it or move the camera. Any help? What kind of controller are you using? Have you tried unplugging any second controllers you might also have plugged in? I'm using a PS4 DualShock 4 but I also have a drawing tablet plugged in. And after unplugging it in I still had the problem and realized it was my mouse that was pulling down and after pushing up on the mouse the camera would change BUT when I let go of the mouse (and it was completely still) it would go back to revolving while looking up. Also now I have another issue where I changed some of the controls and I can't reset them to default so there are some actions like jumping, that I can't do. Honestly I'm just glad that dumb fricking pizza-eating-contest from the first game didn't make it here. Dabbing aside, this is probably the most faithful late-90's-styled game I've played. Everything from the character design to the music to the warping textures to the CRT filter to the 4:3 aspect ration and so on made me feel like this was a game that was ripped straight out of the fifth generation. Heck, it even made me kinda seasick at times. That should be a complaint but I have that problem with games from the era, lol. My only real complaint is that part of the Domino Dungeon where you have to climb the room before the door that you opened in the other room slides closed. The camera and the swinging mechanics just don't want to cooperate in that spot. Everything else was top-notch. There were a few spots where I got stuck, but once I figured them out I got that "Oh duh" feeling I'd get from a game like Portal rather than the "How the actual hell was I supposed to figure out that I was supposed to be killed by that pterodactyl in particular" Crash Warped feeling. The ending was pretty great. Too. and its the same message every time, i can't download it for mac cause it won't work since i got a windows computer. is there any other way you can get the download to something different other then Utorrent? or anyway to suggest to fix this? id kindly appreciate it and hope to hear soon as possible. Rar files are similar to zip files. They compress the files to a more manageable size. If you wanna open it you'll need a program like 7zip or winrar. Alright, so i should download the mac version then? cause as i said before the Utorrent one doesn't appear to work for me no matter how many times i try it. Hi! I'm really excited to give this game a try, but I can't seem to get it to work! Every time I get to the intro cutscene, the music plays but the video doesn't, and when it loads the first level, the music plays but the game crashes. I'm not sure what's causing it, as the menu plays perfectly every time I load the game. Is there any way I can send you folks the crash log? I hate this game. I can't get past the stupid temple because there's a timed part and I can't make it up to the stupid door before it closes. This game requires precision platforming with imprecise controls. In the second room, wall run to the right and try to spam the yoyo to grab the rafters. Then do some swings + wall jumps to make it to the top no problem. Play the other levels before taking on the temple if you haven't already. When I started up the game and went to the first level, all of the platforms were a bright pink, do you think you know what the problem is? Some here, I think that an option to disable gfx filter effect could solve this issue. I've seen a video of this and it looked amazing and solid. Downloading right away. One question though: could you offer a Linux download too, please? I'm fairly sure the Windows build will work with Wine, but natively compiled versions of games tend to work a little better, especially when it comes to controller support. However, I'm unable to bind any inputs to my controller, and the Yo-yo abilities aren't functioning.. I downloaded the MAC build and overtime i try and set inputs for my PS3 controller, a pop up titled "Input Configuration"comes up with the phrase "Press the button or key for [ACTION]" and it appears to have a loading animation in the window and it doesn't stop when I press a key or button. Do you have any idea whats going on? I have the same problem. Pls Help. Unfortunately, I closed the game half way through Domino Dungeon and was not warned that door unlocks aren't saved, If you don't have the time to save door and switch positions, maybe a warning for that level when you're about to quit, it's pretty long. Oh, and a link to this might make the ending more satisfying Domino's App feat. M」. But seriously, you have all outdone yourselves, I guess 2017 really is the year for good 3d platformers. Simply fantastic work team! The new arcane kids are in town. Fantastic game! Thanks so much for doing this gamejam. I hope that, eventually, those pepperonis and C.D.s add up to something. Maybe a True Ending or the like. Lots of people has said this already, but you've done an amazing job on this! Hey, I made an account to ask a question here because I can't seem to find any contact info for you guys, nor can i find any fixes for this on google, anywhere. I tried to rebind a control or two for my game-pad in the "input" tab on the unity launcher and after doing so my controls no longer work. The game seems to automatically reset my movement keys to the d-pad, backwards. The yoyo-button either won't bind to the key i bind it to, or it will, but automatically stop working half-way through playing, and the dab button seems to be attached to an "axis," on the triggers and gets the noid stuck in the animation forever unless i release it very slowly. The dab thing isn't too important, but the other controls are legitimately not working and it's rendered the game completely unplayable. I've tried deleting it and redownloading the game from here but the controls are still saved, despite me being unable to find any "noid" or "unity" labelled things on my pc that would store these presets. Can you help me fix this? I was excited to try this out and it's frustrating me that i can't play it due to these bugs. I'll look into this and see what I can do. In the mean-time, I just about managed to get something playable going. It's not ideal, but even if I can't figure this out I should be able to play. Thank you for the quick response! And good luck to you guys on any future projects, this has been pretty fun so far. I'm having this issue too. Do you know what the Company Name and Product Names are for this game? from there, you can just highlight all the controls and delete them, and the next time you open the game they will be back to default.